Are you tired of family, friends and acquaintances telling you “You need to get more sleep even when you are full of energy. ”? The first signs of facial aging are often appreciated in the appearance of the eyelids. Loose skin, wrinkles and lower eyelid bags can make one appear tired and worn out. These unwanted characteristics of aging eyelids is completely normal and happens to all of us. Need to make some fine adjustments to what age and time have done to your eyes? Dr. Stafford can help. Blepharoplasty, surgical alterations on the upper and lower eyelids, allows for a more rested and rejuvenated appearance. Wrinkles, loose crepy skin and unsightly lower eyelid bags can be improved upon or removed to achieve the desired results. With the guidance of Dr Stafford, blepharoplasty can create deep set dramatic eyes or something a little less dramatic. Lower eyelid bags will be removed and a smooth lower eyelid cheek transition will be created. You decide. Dr. Stafford guides and makes suggestions. Brow lift to help stbalize or reposition the brows may also be beneficial. If you have this procedure, you should consider a brow lift as well. 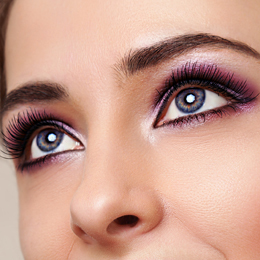 If you think your eyes can look better, and they can, just fill out this short form. Someone from the office will be in touch to answer your questions and schedule a consultation visit. Am I a candidate for upper/lower eyelid blepharoplasty ? Can the procedures be performed under local anesthesia? Upper/lower eyelid blepharoplasty may be performed under local or general anesthesia. The patient can make the choice in conjunction recommendations by Dr Stafford. One may feel comfortable socializing in public after five to ten days. Up to six weeks will be required for 75%of the swelling to resolve. Up to a year could be required and for all bruising to resolve (primarily in more pigmented individuals) and incisions to fade. Some will appreciate an improvement immediately while others may not be able to visualize beyond the normal bruising and swelling. The vast majority will see an improvement by one week post surgery. Results will improve from there as swelling, bruising and inflammation subsides. The effects of blepharoplasty last for many years. It is rare for lower lid blepharoplasty to be performed more than a single time. As a person ages, additional upper eyelid skin may need to be excised a second time but with the slowing of the aging process with a healthy lifestyle and non surgical aesthetic treatments such as lasers, fillers and microneedling, the eyelids may remain in a desirable position. Will my insurance cover the procedure ? Insurance will cover upper eyelid blepharoplasty if an obstruction of vision occurs.